I have come to like many of plants that have been in gardens for hundreds of years. I love to find out the stories behind their common names. Some plants I have grown and others I like from afar, most of these plants have shown that they are still worthy of being in a garden somewhere. 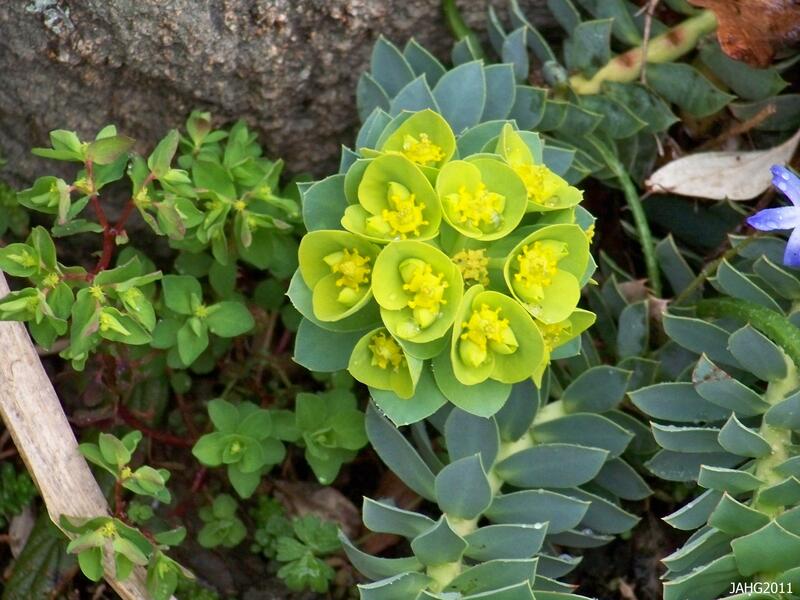 One plant has I like has velvet-like leaves and tiny chartreuse flowers. 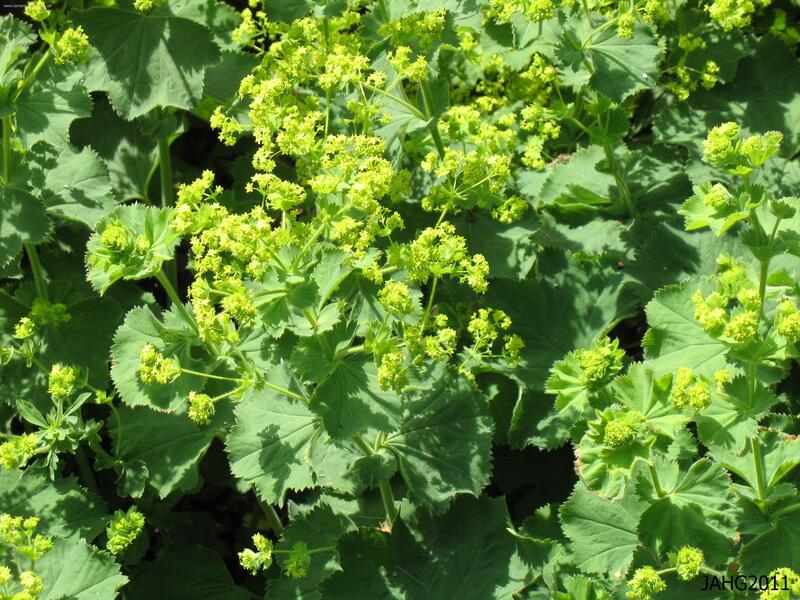 I bet you know what I mean and if you can not guess …..Lady’s Mantle(Alchemilla mollis) is its name. Tiny chartreuse flowers and the sage green velvety leaves of Lady's manltle (Alchemilla mollis) are the feature most loved by gardeners and florist alike. Lady’s Mantle is a plant that comes to us from northern Greece east into western Russia and into the Caucasus then south all into northern Iran. In its natural habitat it grows in wide range of habitats from stream banks to meadows and wind swept plains and mountainous areas. 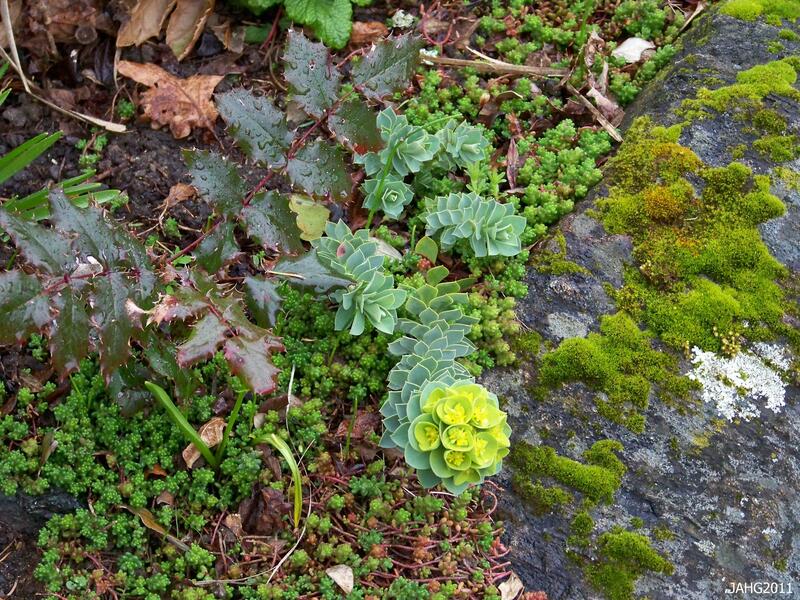 A close relative Alchemilla xanthocholra was formerly named A. vulgaris and is the European version of Lady’s Mantle. It is said to be less hairy than A. mollis. The green-blue leaves of Alchemilla mollis are seductive and beautiful especially in the rain. One can really imagine a Lady's Mantle made of soft material which looks like this foliage. Alchemilla mollis is a plant often seen frothing over the edges of paths or edging paths with its softness in flowers and foliage. It is a beautiful foil to cover unsightly bare stems of all sorts of larger plants and is used this way in many places. The name Lady’s Mantle is said to have come from the edges of the leaves that are similar to a cloak (or mantle) a lady would wear. The orgin of Alchemilla is unknown but is thought to possibly have originated from a Arabic world that has been ‘Latinized’. Mollis means soft or with soft hairs and refers to the leaves. 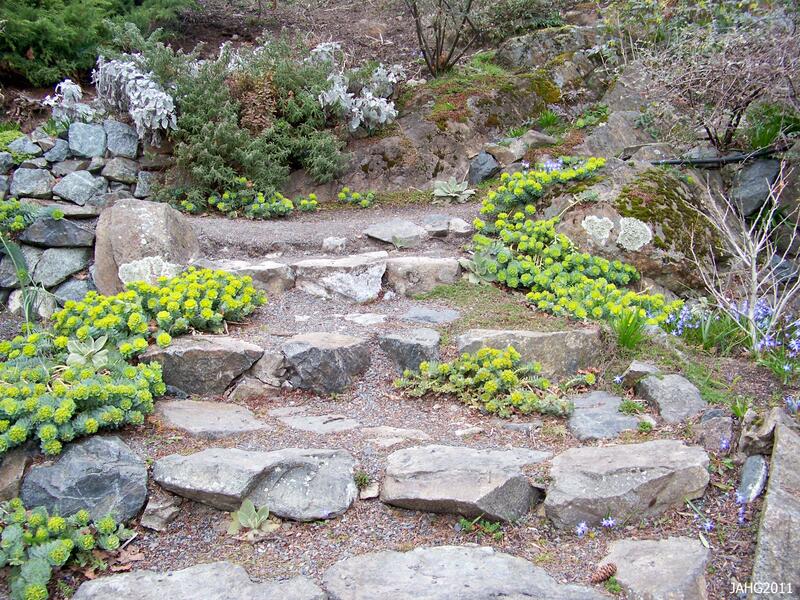 Alchemilla mollis (Lady's Mantle) is used here to soften edges of this sunken Rose garden at Esquimalt Gorge Park. Species of Alchemilla and especially the look-a-like Alchemilla xanthocholra have been much used in medicine in the past. The plant contain salicylic acid (ASA), a strong pain reliever that we use today. Lady’s Mantle was used as a herb for women and was gathered in June and July, the roots were used fresh while the leaves were used when dried. 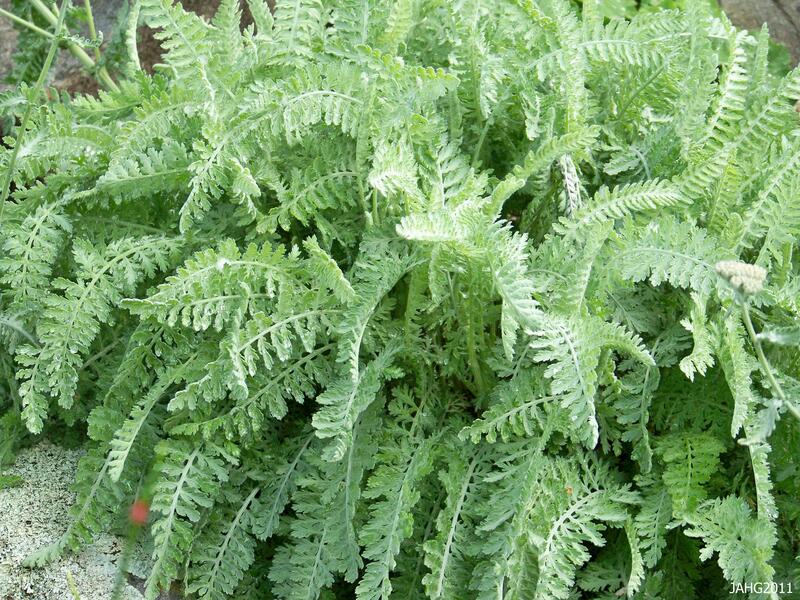 It was used for painful periods and was especially associated with excess bleeding as well as during menopause. It was also used as an astringent in mouth washes for sore gums and ulcers. In this artistic garden the charteuse flower colors of Alchimilla mollis contrasts with the more somber plum and coppery rust tones. Alchemilla mollis is a versatile plant which can be used in many places from fairly deep shade to full sun. That versatility also applies to the growing conditions as it is not to fussy in soil type as long as it does not become water logged or completely dried out. This plant stays a fairly compact 45 cm. (18 in.) wide and high. 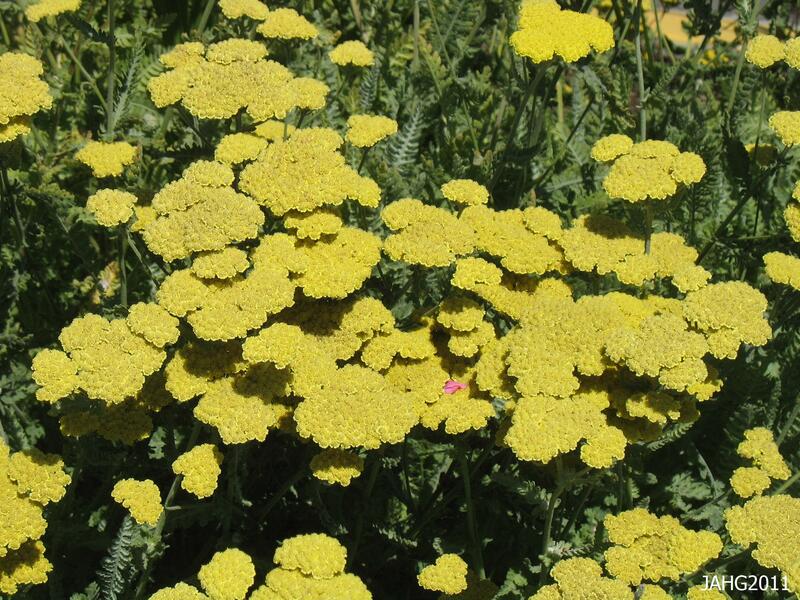 It is a very hardy plant and will survive temperature down to below -40 c. or f. (zone 2-9). 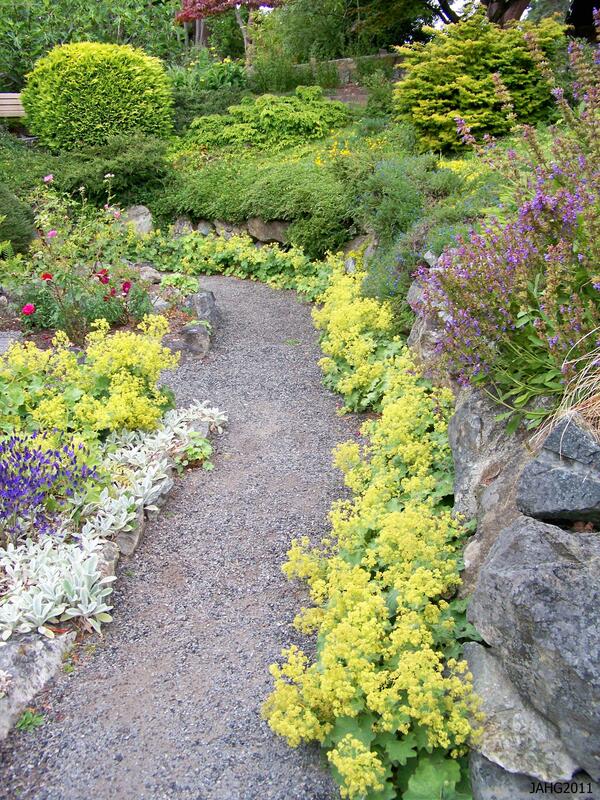 Here Alchemilla mollis take over from hardy Geraniums and leads the Hostas and Asilbes in a wave of color and texutres. 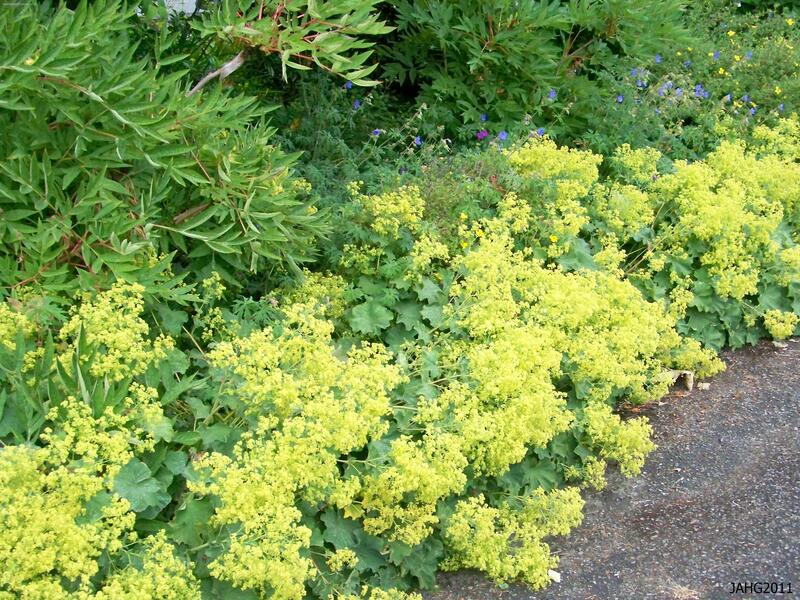 Lady’s Mantle can be used in many ways but it will always be more informal as the plant is loose looking and soft. The most often seen use is as edging along paths where it spills over and softens edges. Another use is to hide more gangly larger plants long stems. 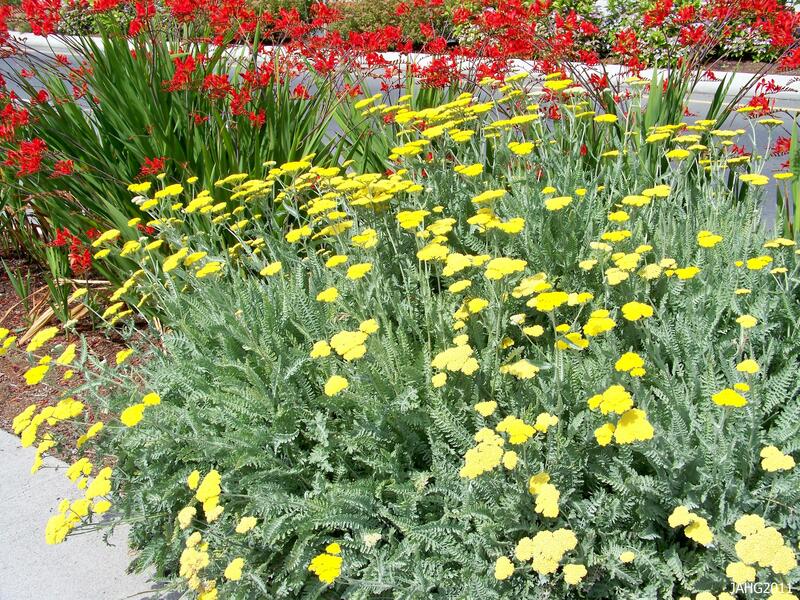 It works well in large containers and give an all year show of color and texture. It should be found in all floral arrangers gardens as the leaves, flowers and seedheads all are used in bouquets. The chartreuse color of the flowers and sea-green foliage of Alchemilla mollis is beautiful in most gardens and the colors are appealing to the eye, many artists have been inspired to include it in painting and other works. 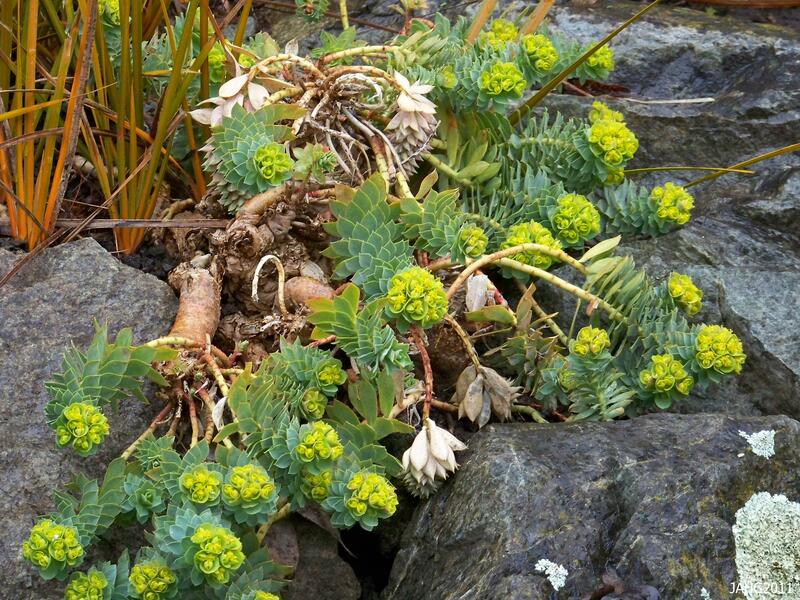 it can be mass planted and used as ground cover and is especially attractive in rocky areas popping out amongst the rocks. There are many plants that just give me the feeling that they have been in gardens for a long time. Plants which are some how familiar when you first see them but you can not think of what it is in that moment. One such plant for me is Kerria japonica (Kerria) which seems sold but was so new to me. Kerria is closely related to the Raspberries (Rubus) on my youth and the stems and flowers are similar. Kerria japonica 'Pleniflora', the double form is most commonly in gardens. Kerria japonica was a confused plant when it was introduced by Carl Peter Thunberg in 1776 and was mis-classified as being a member of the Tilaceae (Linden) family. This happened because the sample which was sent back by him not being complete, the specimen was also the double form ‘Pleniflora’ (Yae Yamabuki). On top of the naming problem was the fact that the plant does not come from Japan originally but was brought in from China as an ornamental shrub for gardens in ancient times. In Japan the single flowered Yamabuki (Mountain Spray) has naturalized and become part of the culture as seen in paintings, poetry and other forms of writing. We know that Yamabuki has been in Japan a very long time as the 11th century novel ‘The Tale of Genji’ mentions the plant numerous times. 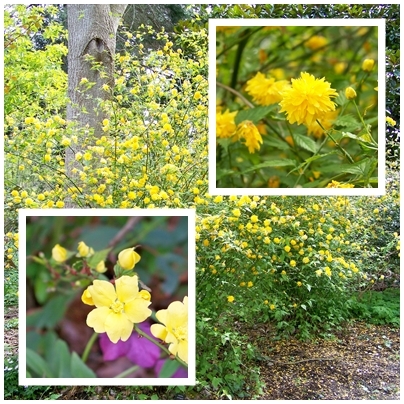 The more common Kerria japonica 'Pleniflora' on the upper right and on the lower left is the single type. 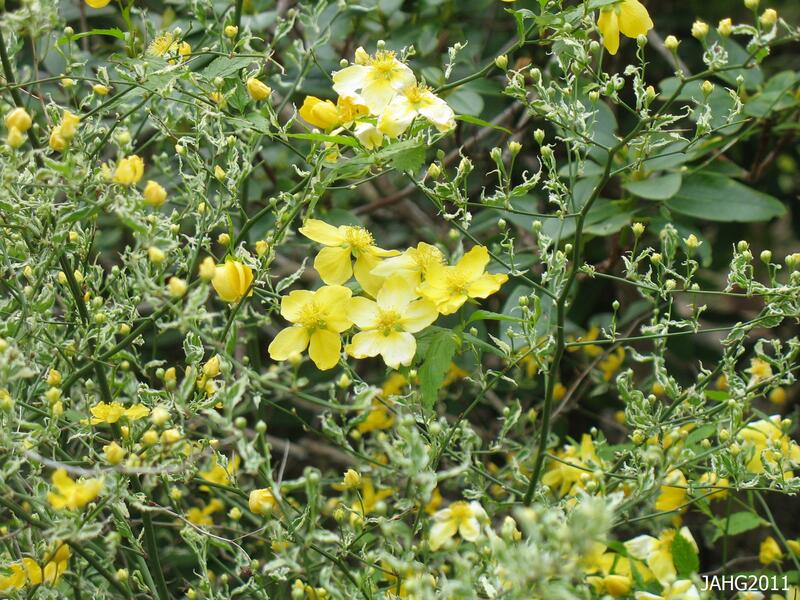 It was William Kerr who in 1804 sent a living specimen of the single flowered plant back to the Royal Botanical Garden at Kew in England It was there that Kerria japonica became recognized as being a seperate member of the Rosaceae family. For this reason the plant is now named Kerria to commemorate Kerr. This unusual double-flowered form of Kerria japonica 'Pleniflora' is found at Esquimalt Gorge Park. William Kerr (1779-1814) was a gardener who was born in Hawick on the Scottish Borders and came to garden at Kew. There he was noticed by Sir Joseph Banks who was in charge of sending collectors and explorers throughout the world to bring back plant, animal and geological specimens to be studied and be classified in England. Banks instructed Kerr and then dispatched him to China in 1803 where he was posted at Guangzhou for 8 years. While Kerr was not allowed to travel in China he sent many important plants back from his location which was a port not far from Macao. During the time that he was posted in China it is believed that he became an opium addict and by the time he was re-posted to Colombo, Ceylon(Sri Lanka) in 1812 he was quite ill. In Columbo he was the supervisor of the gardens as Slave Island and at King House. Kerr is considered to be the first professional of plant hunters which have changed gardening as we know it today. Kerria japonica 'Variegata' (Picta') has single flowers and green leaves which are delicately edged in cream. 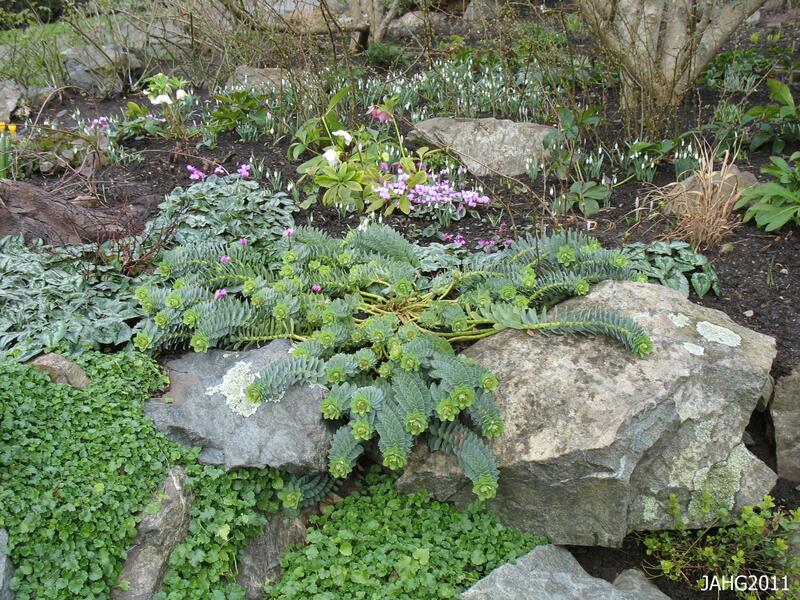 This plant can been seen at Finnerty Gardens. Kerria japonica is interesting in that the most vigorous form is ‘Pleniflora’ which grows into impressive multi-stemmed clumps. Another thing that stands out for this plant is the beauty of them during the period when they are without leaves, what I am referring to is the bright green stems they have and how they almost glow in the gloomy winter and earliest spring period. The bright green stems of Kerria japonica put on a show during the drab winter months here. 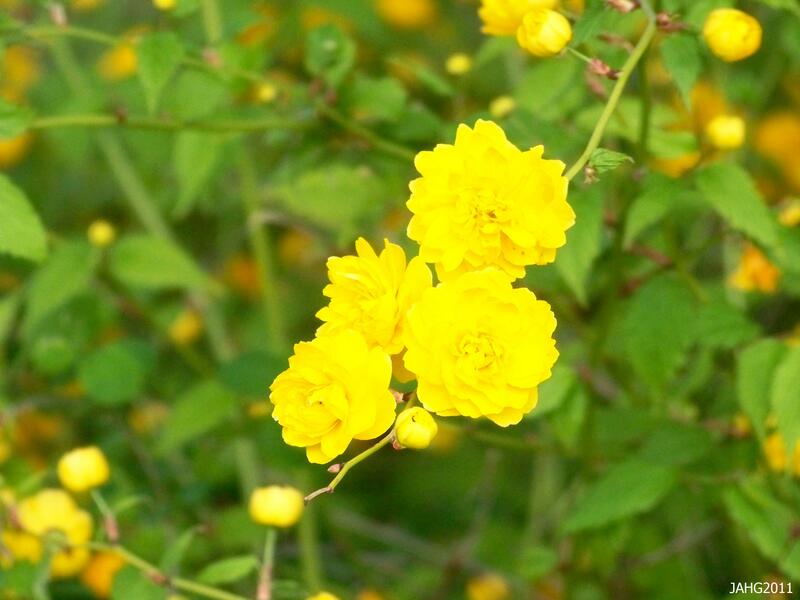 Kerria is an easy plant to grow and is easily placed in most gardens. Kerria japonica like filtered sun as its blooms will completely wash out in too much sun. The best locations are under deciduous trees. The like any soil which has average moisture content and will tolerate a drier location when it is established. As you see these plants can become dense clumps, fortunately they are easily pruned after flowers. cut stems by 1/3 to 1/2 or remove them from the base as you would for Rubus(Raspberry) which they are closely related to. This single flowered Kerria japonica is seen amongst the mixed perennial and shrub border at Government House. 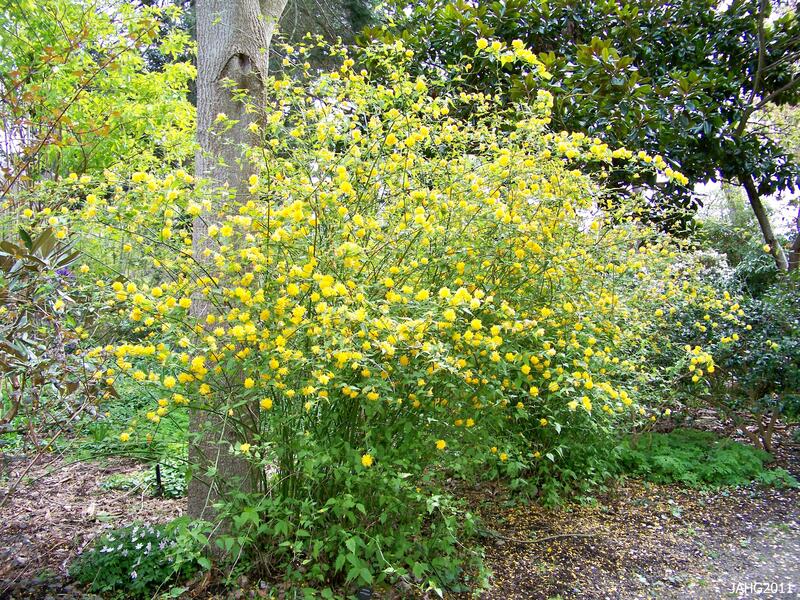 Kerria japonica grow from .9 to 1.8 m (3-6 ft.) tall and about as wide, it has strongly ascending branches. It tolerated temperature down to -15 c. (5 f.) and still bloom very well. 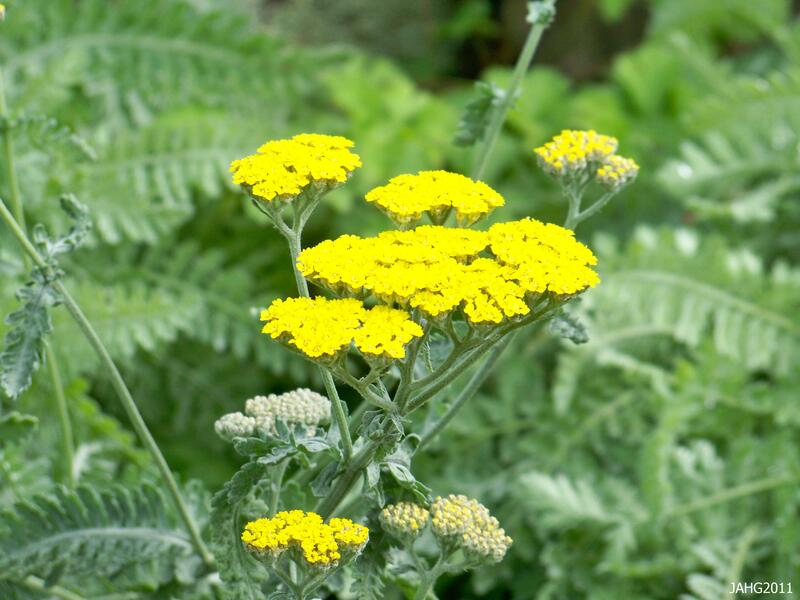 Give this plant protection from cold winter winds and late frost pockets as this can damage the flower production and makes them smaller and less in quantity. 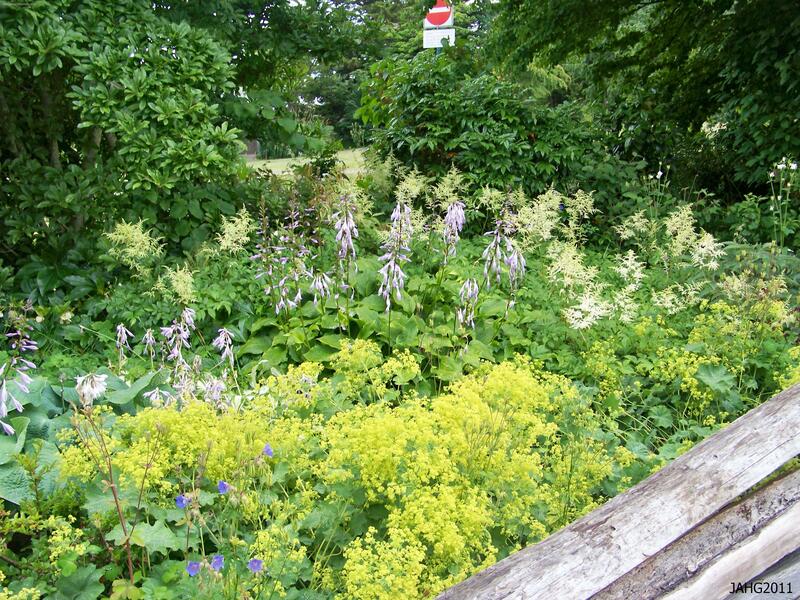 the plant can be used in many ways, as an informal border, mass planted in mixed deciduous borders and for early spring interest. With the right placement it is a specimen or more usually an accent plant. The Victorian feeling this plant gives off makes this plant an excellent inclusion in heritage and period themed gardens. ………Hope to see you on this path soon……….. This is the time of year which is the most exciting in the garden. After a cold winter we wait with bated breath to see what has survived and even will thrive. I note some Rhododendrons seem to have smaller flowers and the Tulips are finally beginning to show their buds. 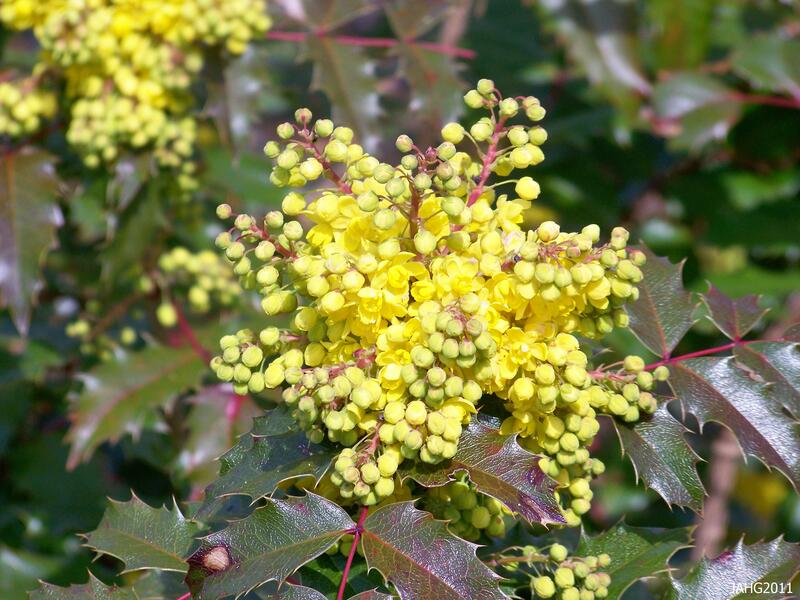 One plant I associate with spring is Mahonia aquifolium (Oregon Grape) which is bursting forth with its bright fragrant flowers. 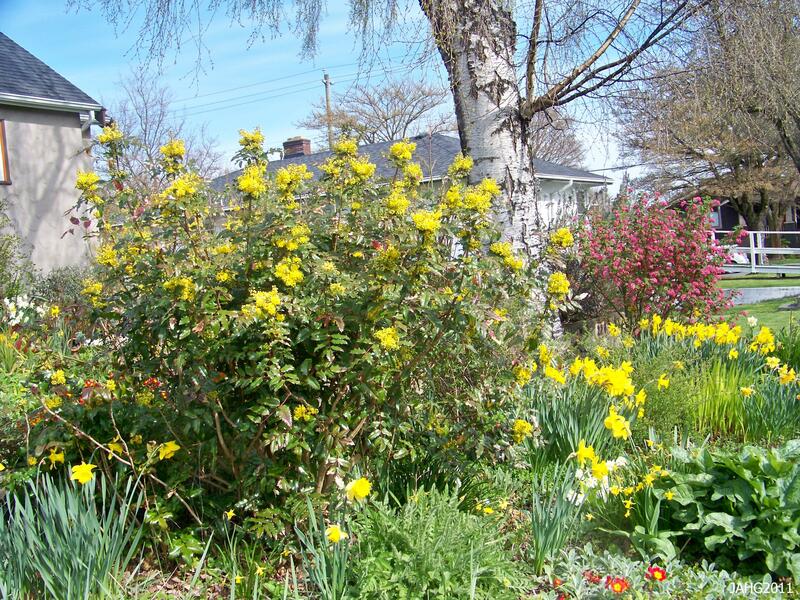 The Oregon Grape(Mahonia aquifolium) here is a welcome addition to this spring garden of mixed bulbs and native plants. Oregon Grape is a shrub which is from the west coast of British Columbia south into northern California west of the Cascade Mountains where this plant is generally found as an understory plant to trees such as Douglas Fir and here Garry Oaks. Mahonia was named after Bernard McMahon (1775-1816) who is said to have been the first ‘nurseryman’ in North America, he published the first plant catalogue and the book “American Gardeners’ Calender’ He was the curator of the plants of the Lewis and Clark collection of plants. Thomas Nuttall honored his friend by using his name as “Mahonia’ for naming a plant (Mahonia nervosa) in the collection. 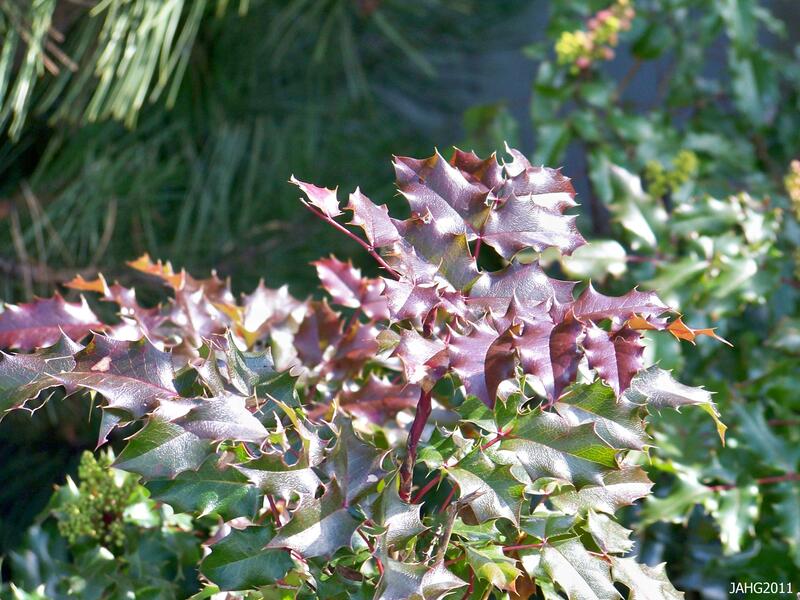 The bright flowers of Mahonia aquifolium contrast nicely with wine tinted evergreen foliage. The leaves( and leaflets) of the Oregon Grape look similar to that of common Holly (Ilex aquifolium) but are larger, thinner and take on maroon and red tints in winter cold. This past winter was colder than normal here and the red tints are very evident on many plant here. Oregon Grape are well-known to the native people here and have in the past been used for medicinal and food uses. 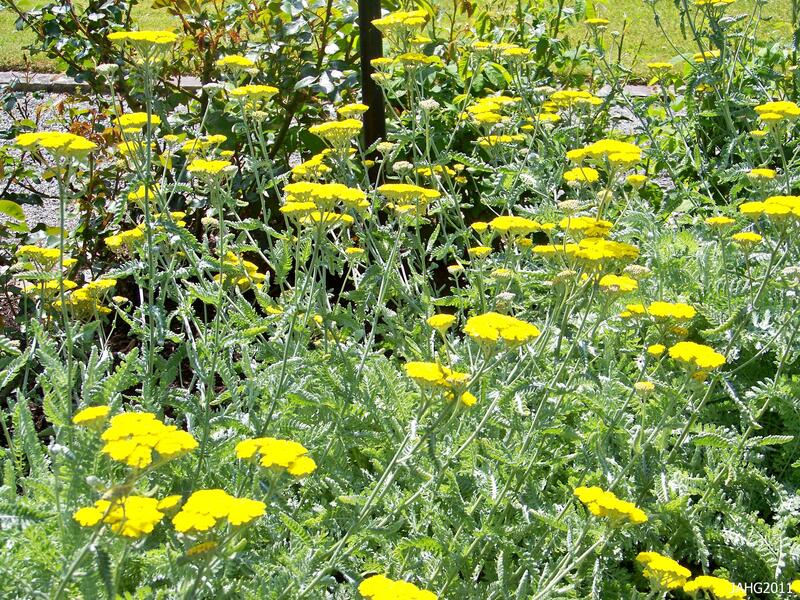 The roots were used to make a tonic which was used to counteract weariness, loss of appetite and other similar maladies. the roots contain the alkaloid berberine which is found in ‘Goldenseal’ and has anti-inflamitory and anti bacterial properties. The fruit was as mild laxative. As a food the berries were sometimes mixed with other sweeter berries to make them more palatable. The fruit is very bitter until touched by frost and then can be used for making jelly. Another way this plant has been used is for dying items, the roots have distinctive yellow sap and the berries provide purple coloring. Oregon Grape (Mahonia aquifolium) produced copius crops of blue fruit which are eaten by birds after it has been touched by frost to sweeten it. Mahonia aquifolium is much used in landscapes today and is often seen as a barrier plant in parking lots where it often is neglected and abused, there are better plants for that purpose. I like to see it used in more creative ways. One of the more interesting uses I have seen is as a background planting to Hydrangeas at Finnerty Gardens in Victoria. 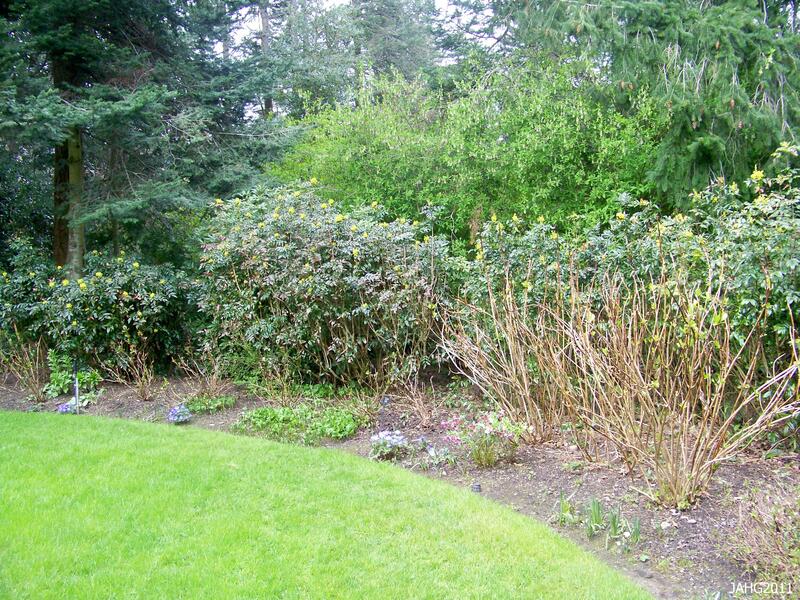 The garden has a collection of Hydrangeas which are dormant when our lovely Oregon Grape blooms. 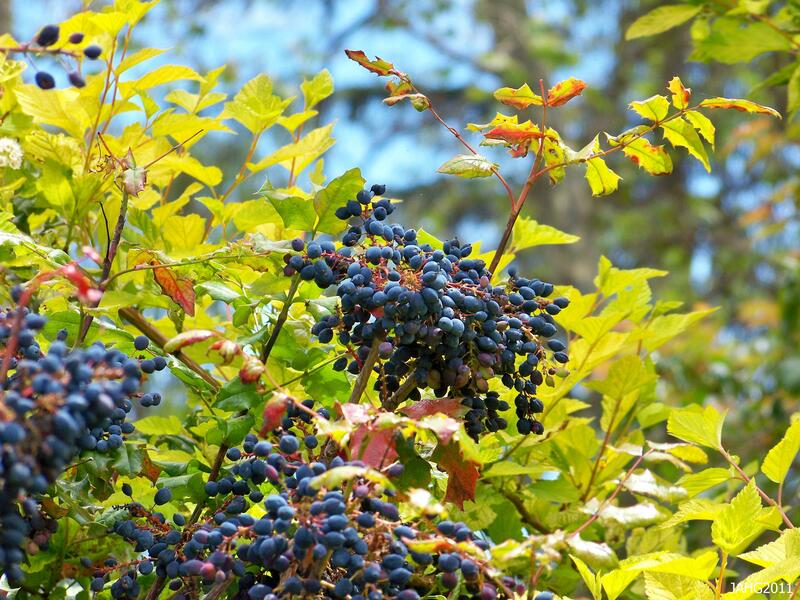 Oregon Grape works as winter and early spring interest and then the Hydrangea will take over for the late spring into autumn with a consistent evergreen background to show it off. Here at Finnerty Gardens the Mahonia aquifolium (Oregon Grape) will bloom while the Hydrangea shrubs are 'leafing' out in front. 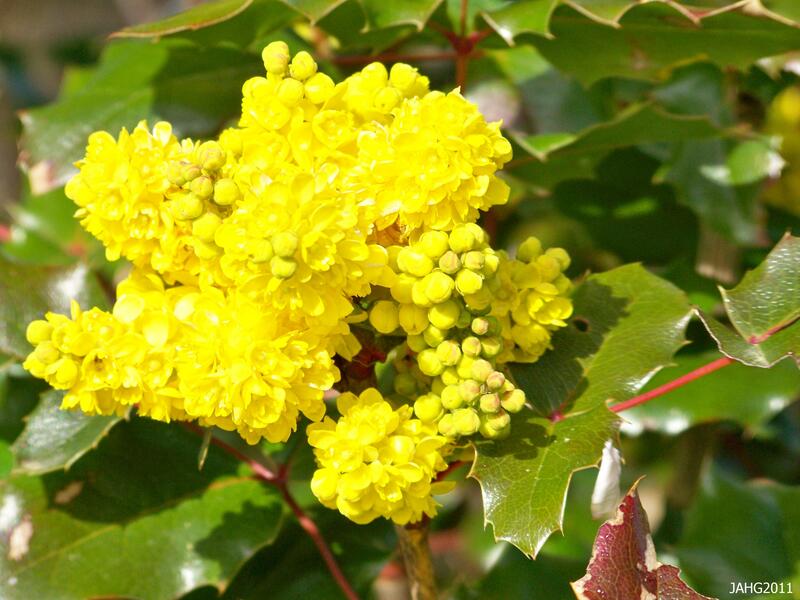 Oregon Grape is an easy plant to grow if it is given the right conditions to grow in. Mahonia aquifolium likes part sun to full shade with the only exceptions in more northern areas where light is not as strong as in the south. For better flower and fruit production give it better light. It grows best in moist, rich, well-drained soil which is more acidic than alkaline. It does poorly on thin, compacted and clay soils which stay wet and are poorly drained. 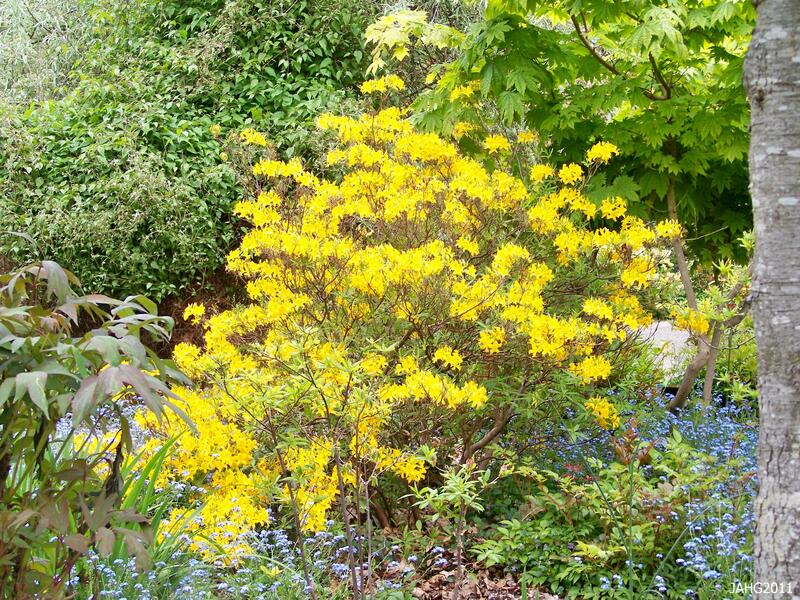 Here it grows under the light shade of deciduous trees and mixed with other shrubs. 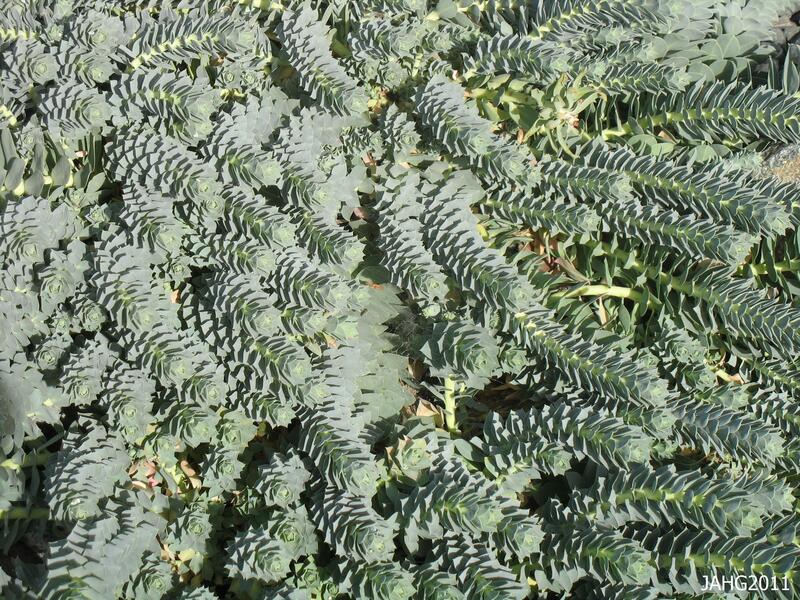 It is best to place these plants where they will avoid the drying winds of winter which can do much damage to broad-leaved evergreens here. Most of the Oregon Grape I have seen here overwintered well with little damage, the added bonus was richer maroon tints to the foliage from the winter cold. The maroon tints of the foliage of Mahonia aquifolium (Oregon Grape) were quite spectacular this spring. Mahonia aquifolium is a slow-growing multi-stemmed shrub which over time can grow to be well over 2 m. (6 ft.) tall. 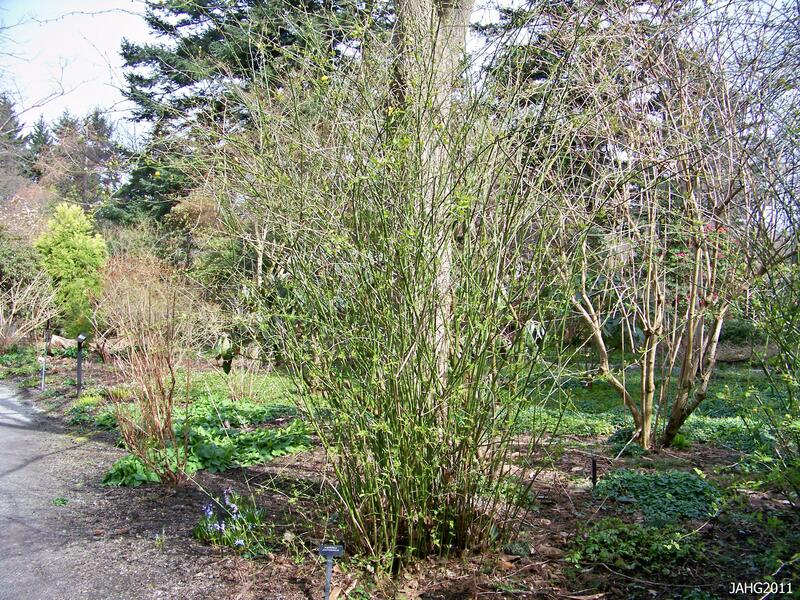 With the branches generally being very ascending , this shrub tends to have a narrow profile. The plant can easily be managed by removing branches from the base. Use this shrub in your native garden or in wilder places which might be a little out of the way. The leaves are prickly so keep it away from narrow paths or tight areas where you might brush up against it. Mahonia aquifolium is well used in mass planting or a specimen. It attracts bees by providing an early source of honey when there might be little available (the flowers are honey scented as well). 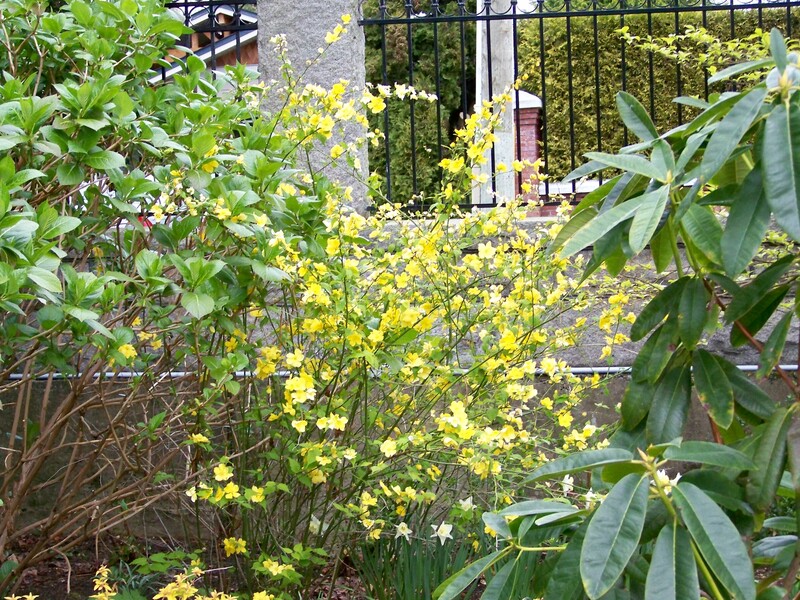 It is known to hybridise with other Mahonia species and these crosses can give varied results in height and sprawling habit. I find the variation in the flower panicles of Mahonia aquifolium (Oregon Grape) interesting, some are stumpy like this one while others are loose and open like the 2nd picture in this article. Mahonia is a much loved plant and has been adopted as the state plant of Oregon which is found between California and Washington. It has many appealing atributes to make a good garden plant which should be seen more ofte. There are 12 Mahonia species in North America and some of these have been listed as noxious weeds, I think that there might be some confusion in listing this species there. A Beacon of Yellow Flashing in the Mists. At this time of the year the seasons are changing from winter to spring and with it comes unstable weather. One minute it is bright and sunny and the next it is almost dark and poring with rain, it is a challenge to get out into the garden to work. At this time I go for a quick walk in the park between rain showers and in a spot of light near the evergreen trees is a bright Rhododendron lutescens shining in the distance. Its pale buttery yellow flowers are almost unreal and beckon me to come closer. 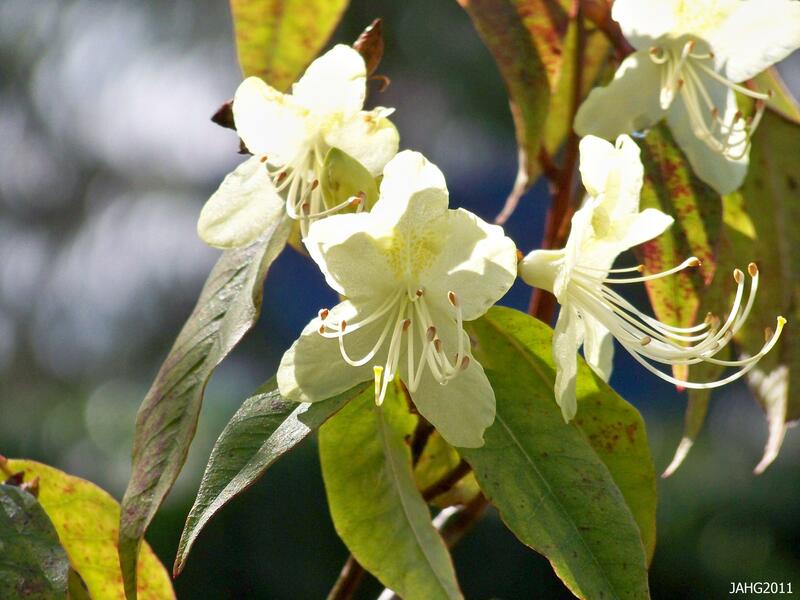 Rhododendron lutescens is a delicate plant with the bright sunny flowers. 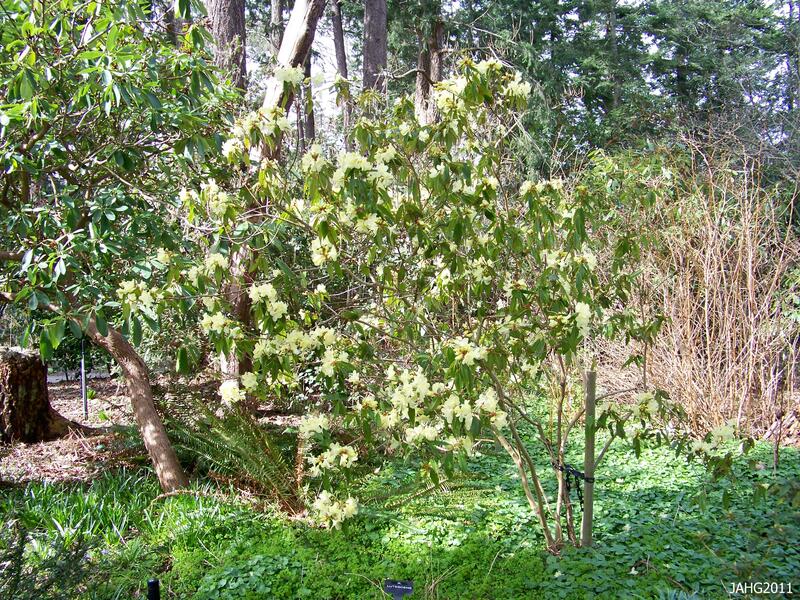 Like many of our favorite plants Rhododendron lutescens comes from the treasure trove of China. The plant is found in north-east Yunnan, Sichuan, Hubei and Guizhou where is grows on the hillsides, thickets, mixed forest and limestone slopes. It grows at elevations of 1700 to 2000 m (5600- 6600 ft.) . In China it is called Huang hua du juan. 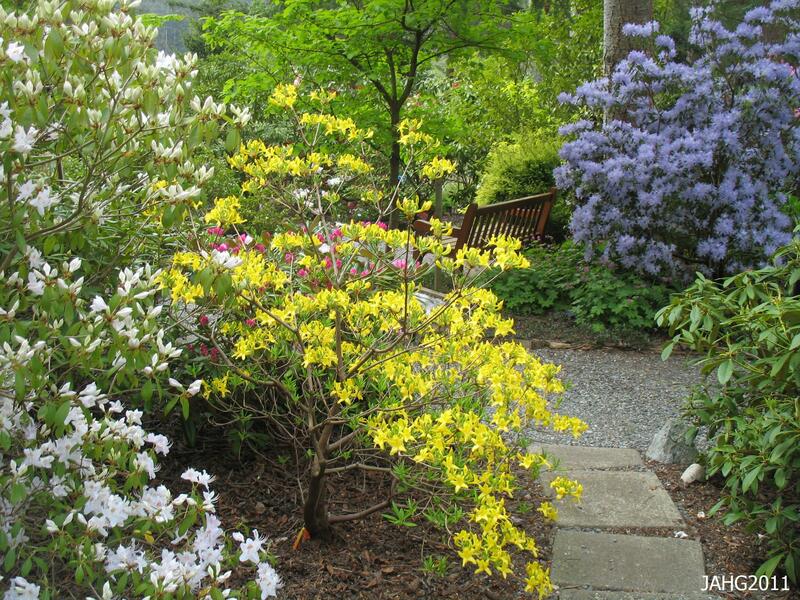 The brilliantly colored flowers of Rhododendron lutescens are a beacon of light in the garden at this time of the year. Rhododendron lutescens was discovered by Pere Jean Marie Delavay(1834-1895) in 1886 who was stationed in Kunming, Yunnan at that time. He was one of the important French Jesuit missionary collectors who explored China and other parts of the world and sent botanical samples(herbarium collections in this case) back to be identified and named by scholars at the National Museum of Natural History in Paris. When these collections were received in Paris Botanist Adrien Franchet would study them and classify the new plant material. E.H. Wilson recollected the plant when he was working James Veitch & Sons Nursery and it was re-introduced in 1904. 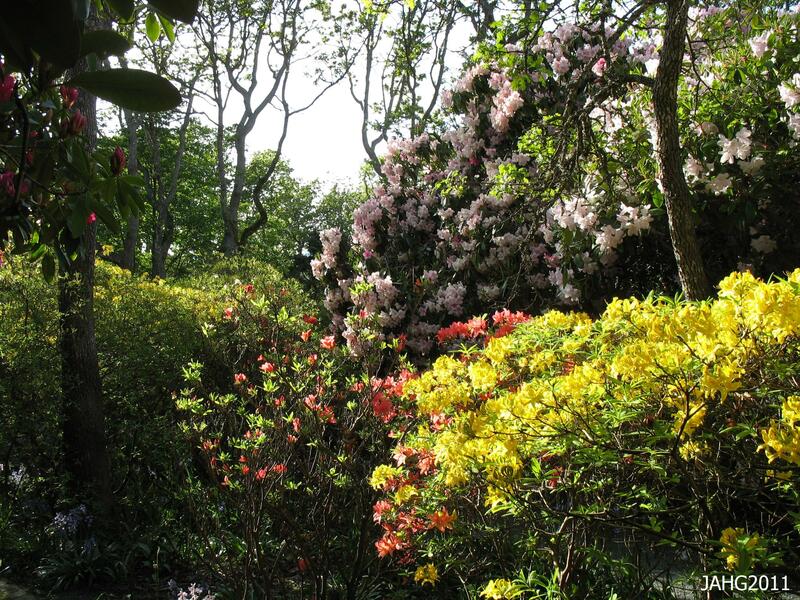 There are 2 Rhododendron lutescens found at Finnerty Gardens as well as 2 at Playfair Park. There are 2 leaf forms(one being narrower than the other) known of Rhododendron lutescens although they do not seem to be recognized by specific names. 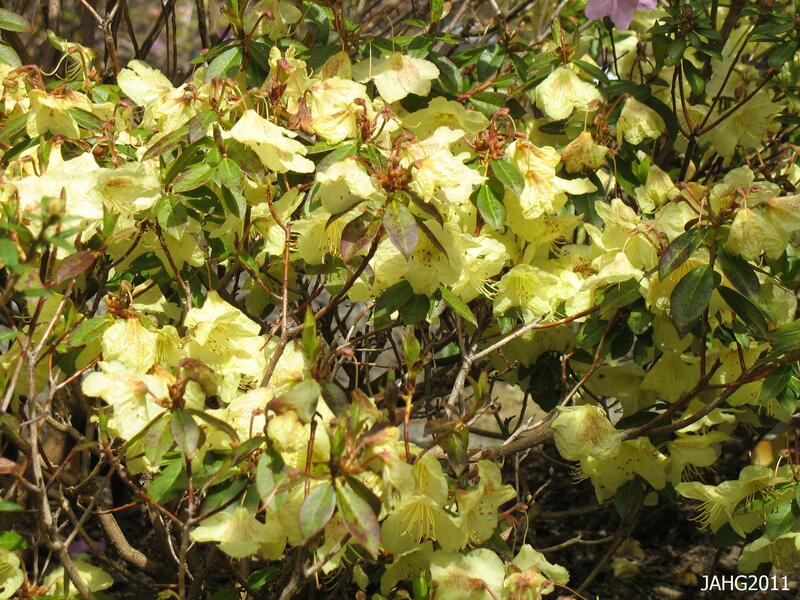 Rhododendron lutescens ‘Bagshot Sands’ is a form of the species which is said to have stronger primrose yellow colored flowers. A notable feature of the species is the exquisite coloring of new foliage which can take on an amazingly deep wine red coloring, this appears to happen after the flowering has occurred. 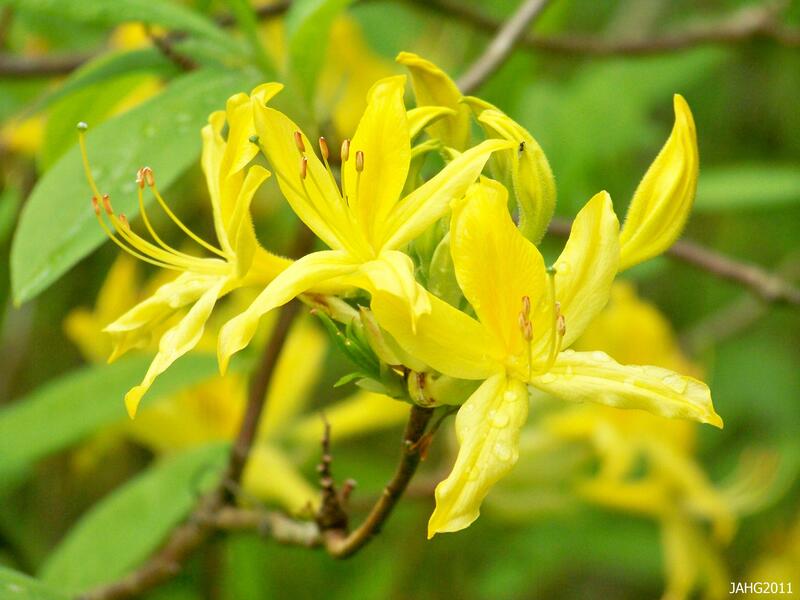 With the yellow flower color, fine delicate leaves and early bloom time, Rhododendron lutescens has been used for crossing with other species to create new hybrids. 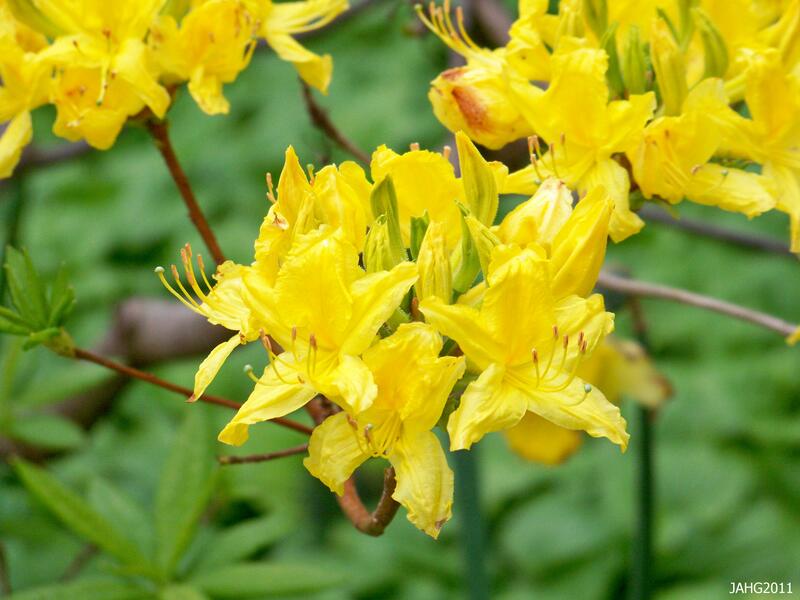 Several are quite well-known such as ‘Bo Peep’ with its creamy flowers and “Goosander’ which has larger buttery yellow flowers slightly flushed with coral on their backsides. 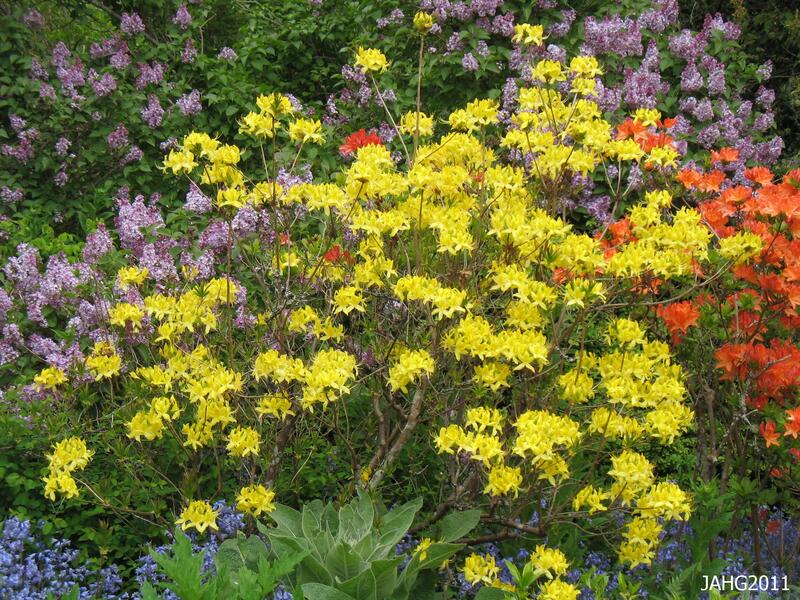 Both of these named hybrids are small in stature and are worth having in any garden. Rhododendron 'Goosander' shows a similar yellow coloring of parent Rhododendron lutescens. 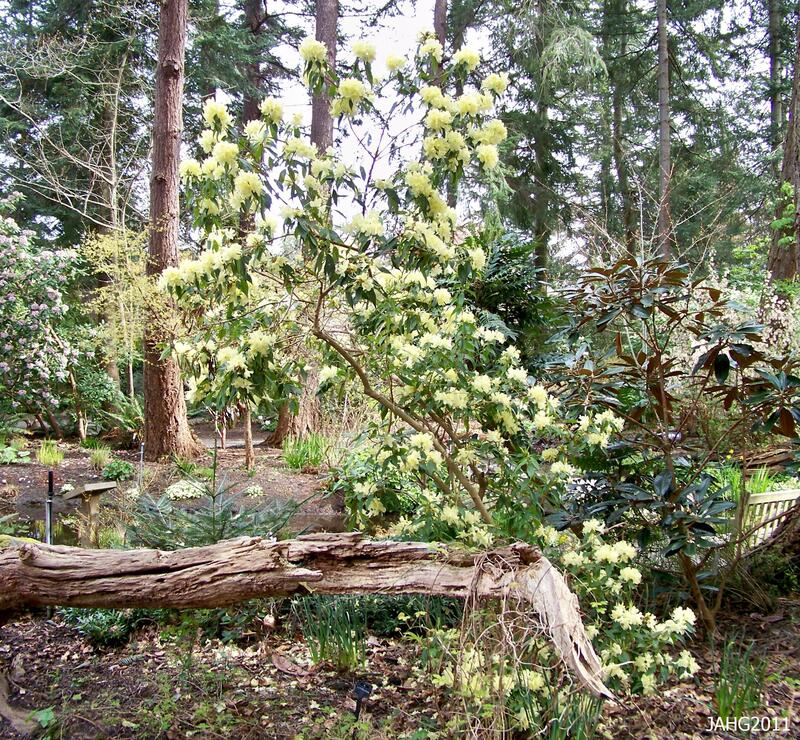 Rhododendron lutescens is a graceful plant which deserves to be better known than it is. It grows best in a location with dappled light or spots of sun as the flowering will be better and leaf color more deep.It likes loamy to slightly sandy soil which is slightly acidic but is tolerant to more neutral qualities as long as it is not too clay rich. 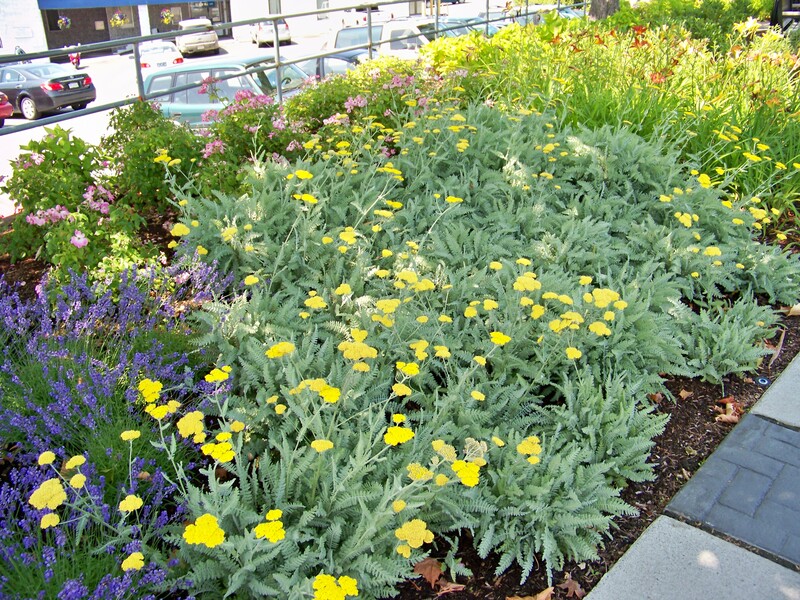 These plants like good drainage and are somewhat drought tolerant. Like all Rhododendrons it has shallow root fine fibrous roots which do not like to compete with other plants, therefore mulch or a groundcover may be the best thing for under the plant. It should be sheltered from drying winter winds. The flowers of Rhododendron lutescens vary in the yellow coloring from very pale to deeper shades and sometimes appear almost greenish. 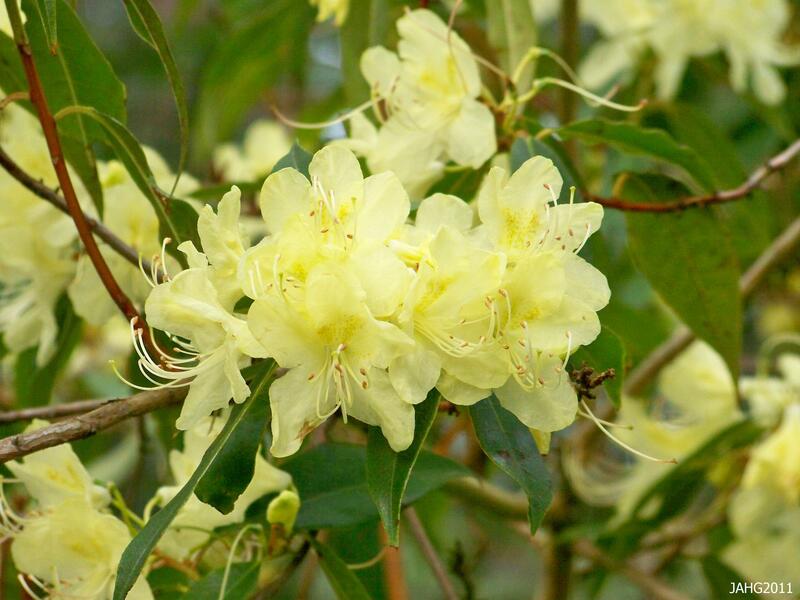 Rhododendron lutescens might be hard to find, check at a specialist nursery or society sales. It is fairly hardy and tolerates temperatures down to at least -10 c. (4 f.). It can grow to a reported 5.5 m. (18 ft.) tall and a narrower width often a multi-stemmed tree form with age. 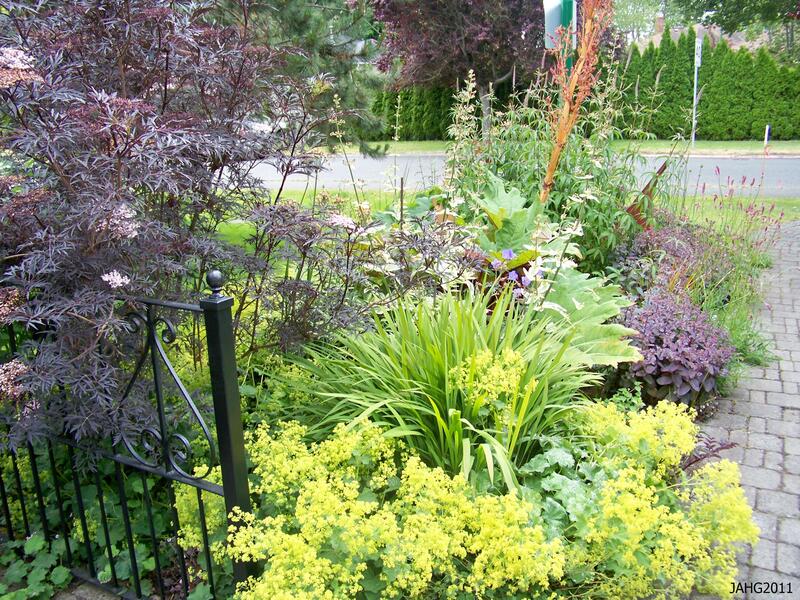 Best placement is in shrub borders, winter gardens, for early spring interest or specimen plantings. it can be mass planted and even is used as an informal hedge in some places.